This is another autumn apparel shoot. This time around I wanted to showcase my preppy side for the season. 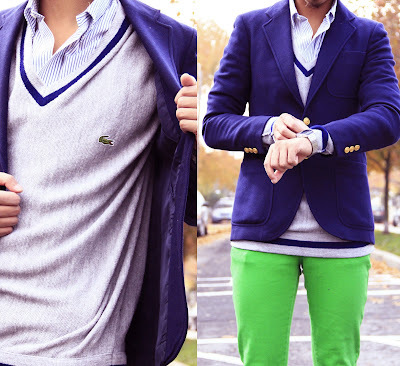 The combination of navy blue and green is perfect for this time around. Cool colors for cool weather. It's a simple look yet it also pops. Adding a beanie to the look adds more character also. Simplicity that turns head at its best. Half body shot with Lacoste sweater. Green jeans and burgundy Florsheim.